Going to a party, outing or night out? You may need loud Bluetooth speakers to enjoy your favorite tunes. Here, we list the best loudest wireless speakers currently available in the market which can be used for travel adventures, party, or outing. These best loudest Bluetooth speakers are selected by testing several products and analyzing the reviews. These are proven to deliver great sound output and better volume without any distortions. We have selected the speakers so that it does not compromise on battery life, portability and aesthetics either. Loudest, Very powerful bass, Robust construction, IPX7 protection, Good battery. 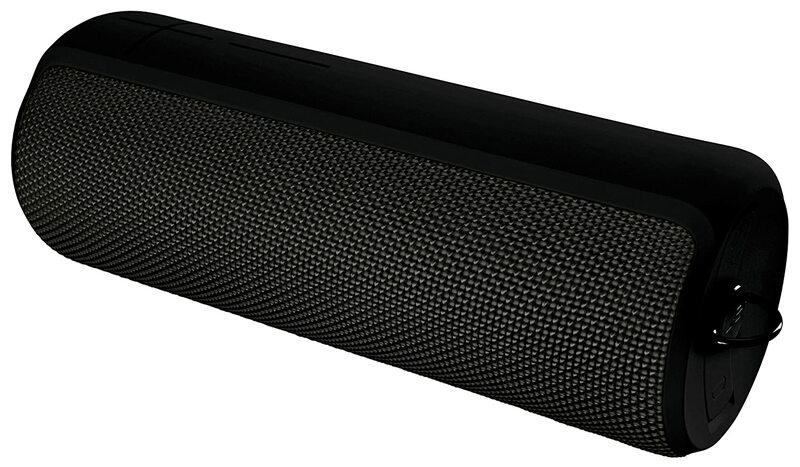 This portable speaker has a cylindrical shape with dimensions of 126x 283x 122 mm. It weighs 2.1 kg and comes with a shoulder strap designed to carry it easily. It is covered with rubber and an anti-splash cloth having IPX7 protection, enough to protect it under a faucet or a shower without problems. 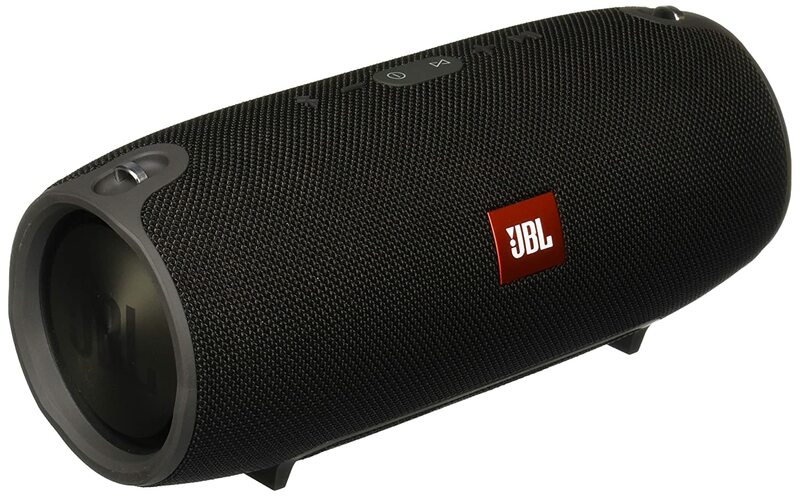 The JBL Xtreme speaker has a very clean output, as it balances all the sound frequency tones very well. A negative aspect is that it presents interferences at the beginning of the songs, something that can be very disturbing when listening to some intros. The JBL Xtreme has 2 woofers of 63 mm and 2 tweeters of 35 mm, which achieve a power RMS of 40W. It has JBL Bass Radiator technology, which consists of two passive radiators located at both ends of the speaker. These radiators amplify the sound and provide an amazing bass power. Its great power can be excessive in small spaces, so it is advisable to use outdoors to take advantage of its capacity. This portable speaker does not have a large range in its Bluetooth 4.1 connection. When exceeding the distance of a few meters can generate pauses in playback. It is recommended to keep mobile devices nearby to avoid this problem. It has JBL Connect technology with which it is possible to synchronize the Xtreme with other JBL speakers. It can connect with a maximum of three devices simultaneously and has a high quality integrated microphone useful for using the speaker at a conference. It comes with two USB ports and one auxiliary 3.5mm. The JBL comes with one of the best available batteries in Bluetooth speakers, with a capacity of 10,000mAh and a performance of 15 hours of playback. It can also function as a power bank for other mobile devices. 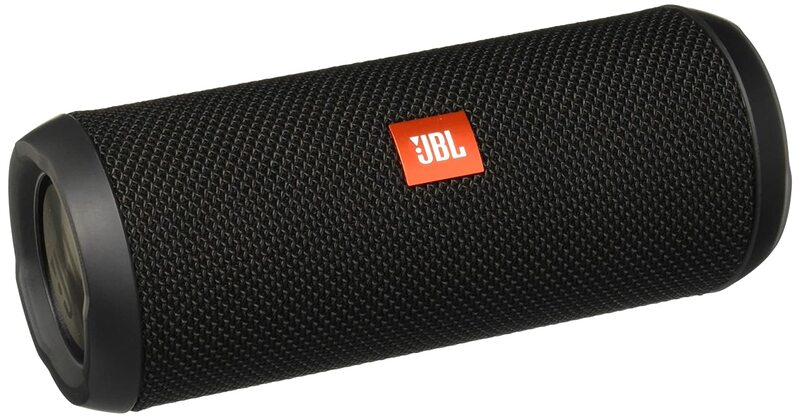 The JBL Xtreme is one of the best Bluetooth speakers in the market. It is a strong and powerful speaker that provides a harmonized sound. It comes with IPX7 protection and has decent dimensions for a portable speaker. It is the best option for those people who are looking for high power backup and high volume output. The third product of Flip series from the renowned manufacturer JBL provides a clean start for most genres and no distortion at all levels low to moderately strong volume. The design is good and eye catchy, where there is no speaker grille, the material is a matte rubber, which houses a power button, a JBL Connect button, and a lockable chamber that protects the 3.5mm Aux input and micro USB connection for charging. JBL has done a good thing by making charging cable lengthier rather than short hideously like most cables that normally come with even high-end Bluetooth speaker models. The only annoying design flaw is that it can roll easily on the safety rope which acts as a kickstand-type, but the speaker is only truly stabilized if it is standing on its end, thereby blocking one of the bass ports. Setting up the speaker is a simple, quick process, and users can connect up to three devices at once, allowing you to switch between music listening devices or to attend calls. The claimed battery life is approximately 10 hours, but the results depend on what volume levels you are using. Flip 3 delivers impressive lows for a speaker of this size. A little distortion is there at higher volume levels but it is not so intense and it disappears completely at moderate levels. It also delivers a rich low-mid presence which gives extra clarity to the vocals and instruments. Although the bass presence seems a little thinner the vocals mids and highs float clearly over the top of the mix. This speaker will be suitable for rock music lovers. For most genres, at high volumes, the speaker sounds great and is definitely the best under $100. Just like the SoundLink Mini II, Boom 2 is also the upgraded model of UE boom with lots of good features and excellent sound quality. The Boom 2 produces a fuller sound and satisfying bass than the former. It has the same design as the original Boom but now it is waterproof rubber-cloth covered cylinder which measures 6.9 x 2.6 inches and weighs just 1.2 pounds. The power and Bluetooth buttons are located on one end and a micro USB power port and 3.5mm jack on the other end. The charging port is protected by a recess and a rubber door. Connections are simple and easy with a lot of customizable features. You can alter EQ settings, set alarm, and you can pair it with another Boom 2 for stereo effect. Performance wise the boom 2 is exactly what the name implies. Powerful for its size! Comparing to Bose SoundLink Mini II, the Boom 2 has more inclination towards bass, it doesn’t distort at high volume levels. While Bose has a more flat response and better clarity in the high-end, Boom 2 has more ‘bass boom’. The UE Boom 2 is better than the first gen Boom in every way but it is in tight competition with the SoundLink Mini II. Even then the fully waterproof feature makes the Boom 2 more appealing. Excellent power and sound, Water resistant, Long-lasting battery. The new JBL Boombox Bluetooth speaker, presented at the IFA, comes from winning the EISA prize, one of the most recognized awards in the world of technology. That’s why It could not miss the list of the best Bluetooth speakers of the year. The JBL Boombox stands out among Bluetooth speakers because of its size. The company has opted in this model for a greater sound capacity against portability. It weighs 5 kg and is 50 cm long. Its design is reminiscent of the portable speakers used in the 80’s. It has IPX7 water resistance, so it can be submerged without problems. The size of the JBL Boombox allows the space to integrate it with four drivers and two passive radiators, so its sound has a lot of depth. It has an additional 20Hz in the frequency response compared to the JBL Xtreme. It is the loudest speaker among the competitors. It has been tested at a maximum of 100 decibels and its capacity, even at 50%, can be set in a spacious room with ease. Another unique aspect in this speaker is its ability to adjust the audio in two preset options: the outdoor mode that gives more power to low frequencies, while the indoor mode offers a more balanced sound and attenuates at frequencies below 70Hz-80Hz. It can connect with two sources simultaneously through Bluetooth 4.2 technology. It uses JBL Connect Plus technology, which allows you to synchronize with up to 100 JBL speakers. It comes with two USB ports that can be used to charge any external mobile device and a 3.5mm auxiliary input. The size of this speaker allows it to integrate a large battery with a 20,000mAh capacity, which supports 24 hours of continuous playback. It can also be used as a power bank to charge other devices. UE Boom, the predecessor of Megaboom was an excellent Bluetooth speaker; it still is even if there are better options available. Now the bigger version has released, more powerful and louder but expensive. The rugged rubber cylinder is IPX7 certified waterproof and shockproof so that you don’t have to worry about damage. The rubber top contains power and Bluetooth pairing buttons and indicator lights. The design is similar to the old Boom but this has more protection against water and shock, the micro USB port, for example, is in a deep recess with rubber cover. The Megaboom is designed simple, doesn’t have much control over it, but don’t worry, you can make advanced adjustments using their Megaboom app for iOS and Android. You can easily pair two Megabooms for stereo setup; adjust equalizer presets, or even turn the speaker on or off using the app. Well, speaking of performance, unlike the name, the sound produced is not that deep boom, but only for ultra-low-end songs. For less bassy tracks, the speaker is awesome. The mids and highs are quite good with warmth and fullness. The UE Megaboom offers strong frequency response with exception of issues with deep bass but other than that, the speaker is just fine. The SoundLink Mini the first iteration of the series impressed us with smart design, features and loud sound. The upgraded version II is priced the same and has better features too. Like the earlier model, this one is also extra portable measuring 2×7.1×2.3 inches. It has the same elegant design with power, volume up/down Bluetooth and a multi-function button on the top panel and a micro USB charging port and 3.5mm audio jack on the right side. The connection and pairing process is quick and easy as with most of the Bluetooth speakers, but this one has an interactive helpful guide to point you step by step. Every time your paired device comes in range, the speaker gets automatically connected. You can also connect multiple Bluetooth devices for music and calls. It comes with a charging cradle powered via micro USB cable but it can be charged directly too. This micro USB charging is one of the upgrades over the first model. Speaking of performance, the bass and total output is rich and powerful at mid-level but gets distorted slightly at high volumes. The vocals too have the richness and warmth at every level. Its passive radiators really do bring out the low-mids and lows at moderate listening levels. Anyone looking for a clean and powerful audio from a portable speaker would love the SoundLink Mini II. 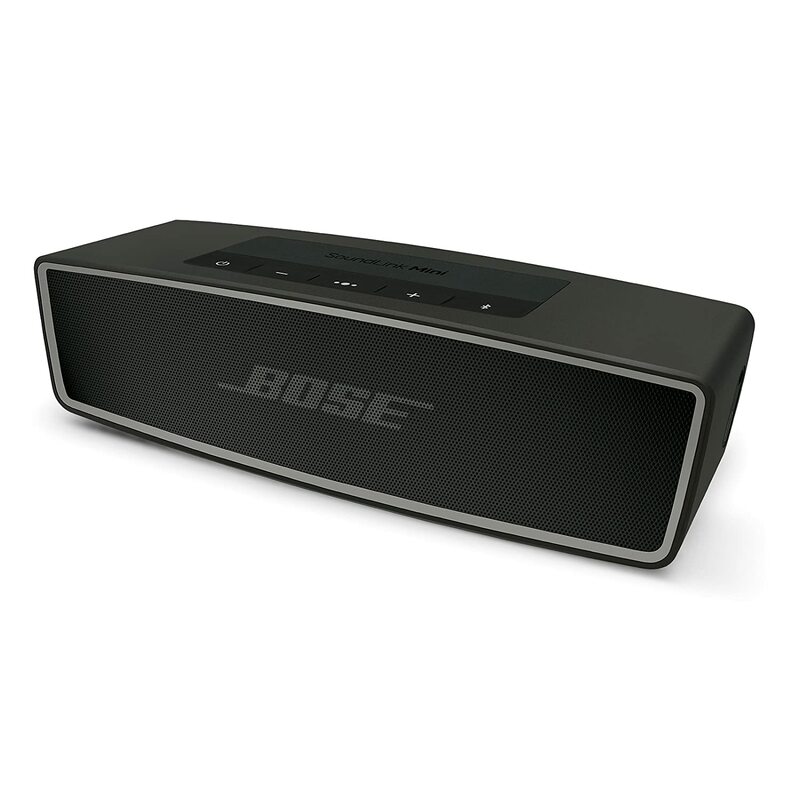 The Bose sound link Mini II can be an easy choice for everyone who wants a powerful yet compact portable speaker. 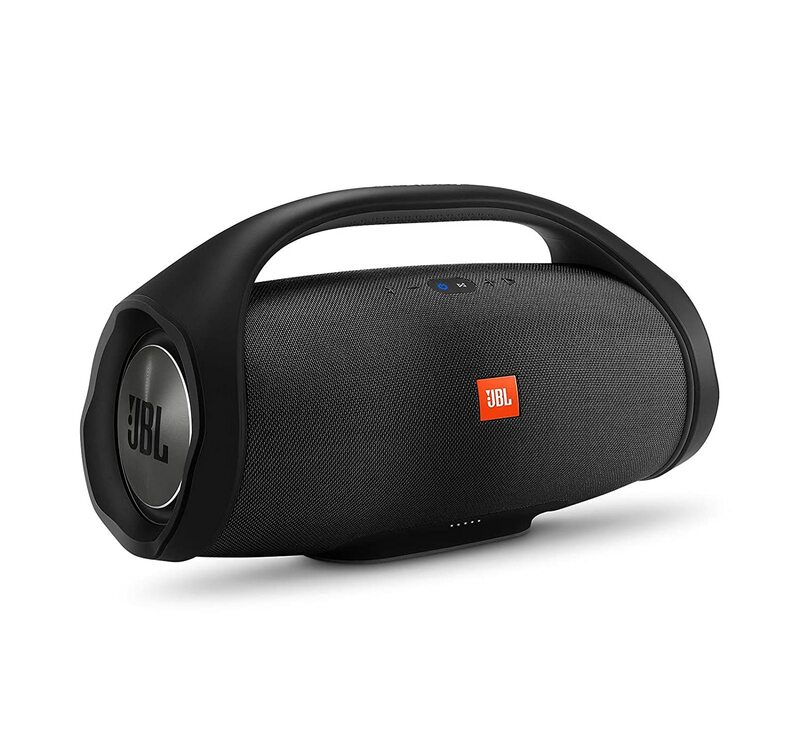 The JBL Go will seduce you with the sound quality of the brand and the careful design. Its weight does not reach 150 grams and is really compact. It has long and high measures similar to those of a credit card and its thickness is 3 centimeters. It is available in eight striking colors, so it is easy to choose one that suits your tastes. As a negative point, it must be said that its resistance is not like that of other speakers, which withstand water and shock. However, if you want to give extra protection, there are exclusive silicone cases for this model. It has no resistance to water. It is for you if you use the speaker at home or at work, to listen to songs, podcast or radio over the Internet without relying on cables. 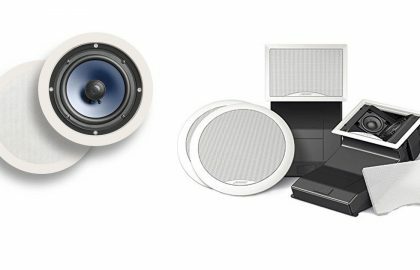 You want a powerful sound to make small parties or use the speaker outdoors. You will not subject the speaker to water or dust, you do not want it to play sports or take it to the beach or pool. You are an audiophile. Although you understand the limitations of this type of speaker, you look for a clear and complete sound, without distortions. With their Turtle Shell speaker, Outdoor technology, a company which specializes in the audio products for travelers and outdoor enthusiasts have created a device that not only offers excellent sound quality, but it is sturdy enough to take with you wherever you go. 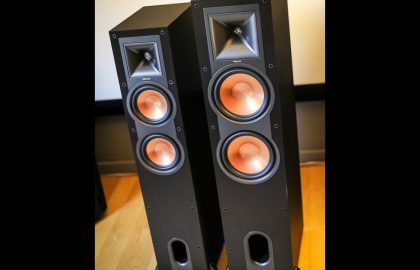 It has a large center speaker which is able to turn the crank of the tunes to an impressive 110 decibels and it also includes twin tweeters that help to add a bit of distinction and separation for the sound too. Additional features include a built-in microphone that gives the BTS the possibility to be used as a hands-free loudspeaker which works surprisingly well. The huge 7800 mAh battery is impressive also, which allows it to play music for a maximum of 16 hours between every charge. With the integrated controls on the loudspeaker, you can pause, start and skip tracks as well as to adjust the volume directly from the speakerphone speaker itself, whereas 3.5 mm ports allow you to connect non-Bluetooth audio sources. The design of BTS is one of the very unique in the market. The device has a number of edges and corners, giving it a unique look like nothing else on the market, with the possible exception of his little brother, turtle shell original. It has a large enclosure, and while it is still portable, it is not as easy as some of its competitors to carry around on a long trip abroad. Accordingly, the loudspeaker has a rating of IPX5, which means that it is completely dust proof and water resistant, but don’t immerse it in the water. I am sure that there are consumers who will take a look at the price tag of BTS and come away with a little shock from the deal. 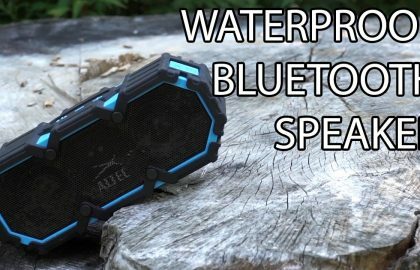 Yes, there are other Bluetooth speakers on the market which can be bought for much less money, but not all have the turtle design and ruggedness. If you large and loud portable speaker for your use around the house or the local park, it is difficult to beat the Big Turtle SHELL. 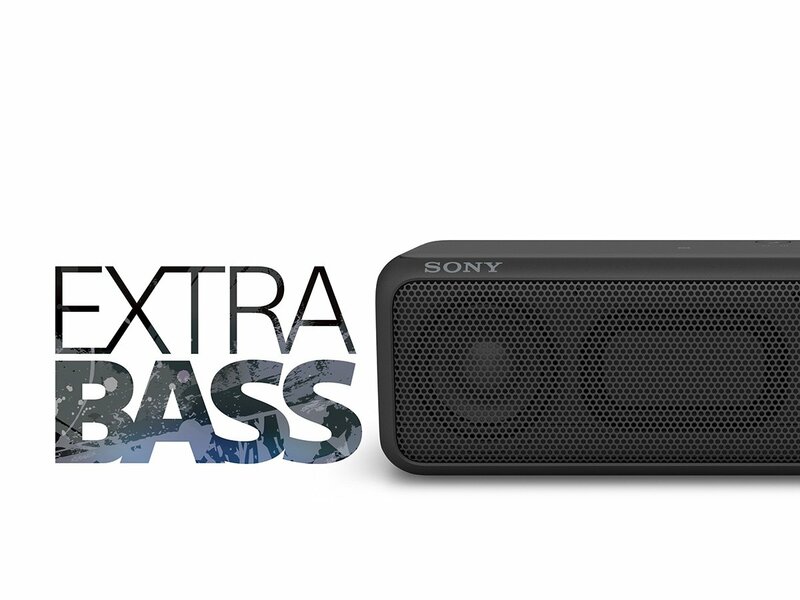 Sony’s SRS line of speakers is well-known and well-received as solid performers in the field. But when it comes to the competition, you have plenty of others to choose from like the SoundLink Mini II or Boom 2 or Braven BRV-X which puts the Sony out of consideration. But then again, for the sound quality and clarity, we cannot ignore the Sony from the list. The X3, cheapest in the series comes in many color variants. Design wise there is nothing much to make you go wow but it is a standard as I like to call it. The top and sides of the speaker are coated with a rubbery, matte plastic finish, and the edges are outlined in black. All the controls are located at the top panel like power, Bluetooth, speakerphone, audio source switch and volume buttons. The back side includes a power port, 3.5mm jack, and a reset button. Pairing is simple and quick with any Bluetooth or NFC enabled device. Once connected, the two 10 watt drivers and two passive radiators do their job just fine. The X3 sounds good, with clear mids and highs but the lows are not that powerful. It has speakerphone function which is very useful if you don’t want to miss a call and is super portable with loud sound that can easily fill a room. But as I said, there are better options available, if you don’t care to stick to Sony brand. 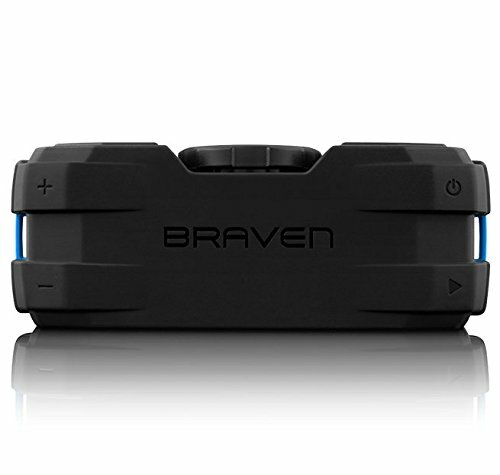 The Braven BRV-X delivers better sound and is waterproof and shockproof. The SoundLink Mini II, although is not rugged as BRV-X, delivers warmer and fuller sound than the X3. Braven’s BRV-X portable Bluetooth speaker combines power with the functionality and ruggedness that makes a sound system truly enjoyable. The front speaker grille hides two powerful drivers and a status LED. Power, Bluetooth Pairing, Play/Pause, and Volume Up/Down controls are located at the top of the speaker, and the volume controls work independently too. The BRV-X is loud enough and can be heard from quite a distance, unlike many portable speakers its size that drop off at relatively short distances when outside and away from walls. 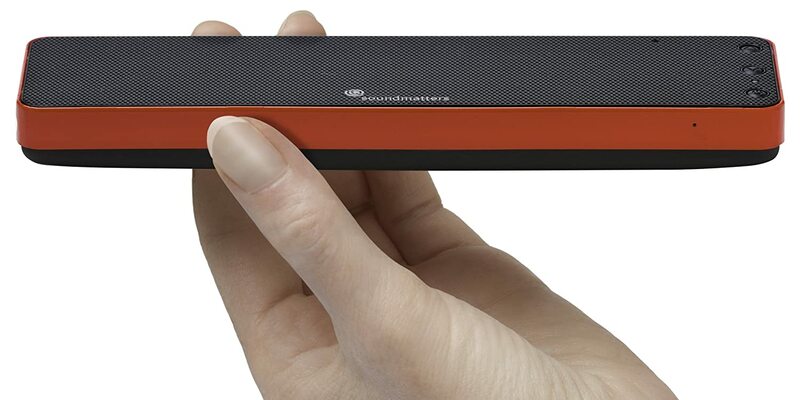 Jawbone introduced Jambox which revolutionized the Bluetooth speaker industry, but Soundmatters is the company that provides key audio components for the Jambox. Like the Mini Jambox, the new FOXL Dash 7 is a very thin speaker measuring only 0.75 inches deep and weighs just 0.44 pounds. Overall it is a very nice little speaker that comes in a few different colors and obviously good for travelers. As far as connectivity goes, there is an audio input for non-Bluetooth devices and a port for optional connection of Sondmatter’s palm-size active sub-woofer. Battery life is rated at 12 hours for wireless transmission, which is better than average for this type of speaker. I think the 7 Series design has some advantages. I like the rounded corners and are slightly lighter than the Mini Jambox but feels almost as strong. The sound is extra loud for its size. It is stronger with the acoustic tracks, which has good clarity and also works well as a mini sound bar to watch video on a tablet or laptop. 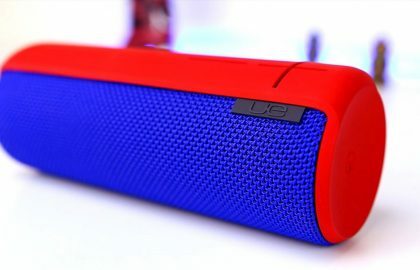 At present, it will cost around $ 220 in the retail shop, while the Mini Jambox can be bought for about $ 50 less. There are better-sounding $200 wireless speakers, such as the UE Boom and Bose SoundLink Mini that are about twice the size and weight and they’re the better choice if you want better sound. But for the convenience of having a tiny, relatively decently performing speaker that takes up little room in a bag, the FoxL Dash 7 cannot be defeated. The BeoPlay A1 is a portable speaker with an excellent construction and great sound quality.The aluminum speaker weighs only 600 grams and is resistant to dust and water splashes. The company, known for its fine materials, added a leather strap for users to be able to hang it anywhere. Its impeccable design was made by the famous industrial designer Cecilelie Manz. As for the sound, the BeoPlay A1 is equipped with two drivers of 15 W class D and two tweeters with a power of 50 W. This generates great clarity when it comes to playing musical instruments. Voices and high pitches are perceived with exceptional clarity. The low frequencies are heard with good power, considering the size of the speaker. By testing the range of the Bluetooth connection we were able to achieve a distance-free reproduction of 20 meters. Obstacles, like walls, can reduce capacity, but it is one of the limitations of a Bluetooth speaker. You will need a built-in microphone, in order to use it as a conference speaker or to make calls if you want to use it as a ‘hands-free’. It has a 2,200 mAh battery, which, according to the company, can play 24 hours of non-stop music. However, when testing the speaker with moderate volumes it gave us about 18 hours, which is still great! At maximum volume, the battery has a real duration of 4 hours, which is not bad either. The BeoPlay A1 is comparatively expensive for a speaker of its size, but the quality of the construction and the sound of this portable speaker justify it. We could get bigger and more powerful speakers for the same price, but if you are looking for an omnidirectional sound in 360 degrees of good quality and good design, this speaker is a great option.